To me, pots offer a uniquely human connection, for they are an inevitable extension of the potter's hands, inner force, and sense of beauty. Their intimate use continues a long standing tradition and unspoken communication between maker and user. For as long as I can remember, I have been a keen observer of nature and form. My work has always been balanced within an asymmetrical vein and intrinsic to nature. The things I observe become ideas that are then either intentionally or unconsciously integrated into the work of my hands. I love the feel of clay; sensuous, plastic, and capable of recording the slightest imprint. I have always altered the symmetry of my wheel-thrown forms and explored sculptural realms. The whiteness of porcelain offers me a smooth, three-dimensional canvas, which I can color, alter, and make translucent. When the need to draw overcomes me, and the forms respond, I decorate. My printmaking background allows me to draw and carve relief surfaces on the clay. I look at my own woodlands, rocks and flower borders, and patterns in nature for most of my subject matter. 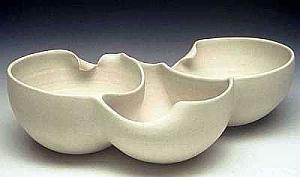 Simplicity has always been my compass and my work is influenced by the porcelain clay itself as well as the Artist Georgia O'Keeffe, and Yi Dynasty Korean pots.